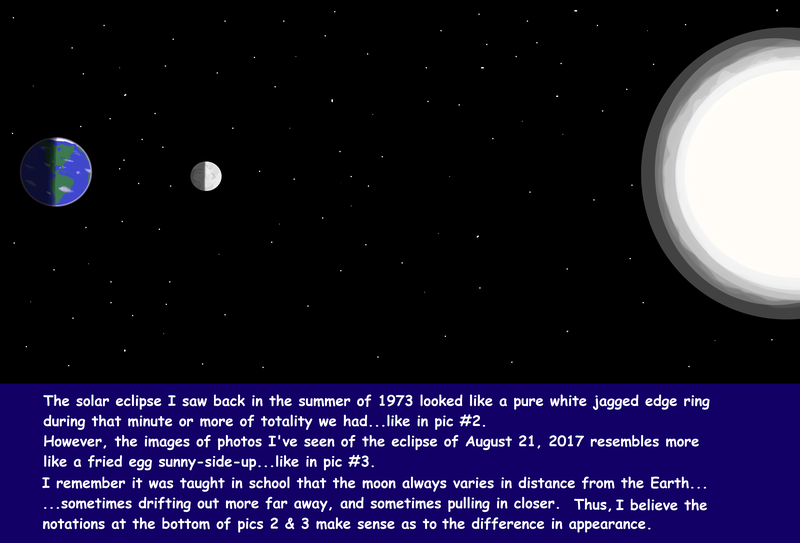 The appearance of a solar total eclipse in 1973 differed in appearance from the eclipse that took place on August 21st, 2017. There is an explanation that makes sense as to why. I am not 100% sure if that is the reason. However, I am putting it out there, explained in the text attached below the pics. If anyone has a different take on it, or a different theory, feel free to comment. Too funny, NASA says "Eclipse" and everyone falls all over themselves quoting "science." Somebody mentions "climate change" and all of a sudden it's "Fake news." I thank you much, and for the fave. yup and with the internet you can watch events n the totality zone without having to travel long distances. That woman with the cheap sun glassed seems like one of those folks you have to tell, "Lay down before you hurt yourself". The eclipse that will be in 2024 is predicted to have the center of the path of totality to move right over where my home is near Clinton, Arkansas. That woman with the cheap sun glassed seems like one of those folks you have to tell, "Lay down before you hurt yourself".. Yes, you are correct!as Ron White is fond of saying: "Ya can't fix stupid"
and awesome on the 2924 event just wait for all the nut-jobs to once more to start moaning doom and 'it's the end times"
I heard one that goes, "Ignorance can be fixed, but stupid is incurable". Yea,in april,2024, it should be a good partial eclipse. I have never been offered a total eclipse in my area, let alone the Eclipse Wind or the bands of light & dark going over the land. (Too many trees & buildings in anywhere I went). I thought the path of totality of the future eclipse will be just north of NYstate, which would put my Bergenfield,NJ home in a good region of partial eclipse. The reason primarily is that the corona of the sun varies wildly from one day to the next. That would make sense. Could be the corona was less active on the day of the 1973 eclipse, and really kicking it on August 21st, 2017...Could have even been a little of both for all we know. Thanks for the fave and comment.